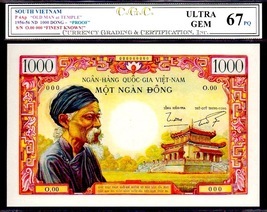 SOUTH VIETNAM P4Ap 1955-56 ND 1000 DONG "The OLD MAN at TEMPLE" PROOF note - CGC 67PQ FINEST KNOWN by ALL GRADING CO'S! THIS PIECE (TYPE) IS SOUGHT AFTER AROUND THE WORLD! THERE WAS A LOWER GRADE IN 64 THAT JUST SOLD IN AUCTION (HA) EARLIER IN 2015 THAT HAMMERED AT ABOUT 33,000 (AGAIN IN JUST CU 64) . THREE OR FOUR YEARS AGO WE LISTED ONE (THE MUCH MORE COMMON "SPECIMEN” TYPE WITH RED STAMP), WITHIN A WEEK IT HAD ABOUT 400 HITS AND OVER 14 OFFERS AND WAS CLICKED ON ONE LAST TIME BY A CLIENT IN ASIA, WHERE THE NOTE CURRENTLY RESIDES, NEVER TO SURFACE AGAIN. THE PROOF IS MUCH RARER THAN THE SPECIMEN (WITH ONLY A FEW KNOWN THAT I KNOW OF). THIS PARTICULAR EXAMPLE HAS INCREDIBLE COLORS (DEEP AND RICH), AND VERY STRONG DEEP PUNCH THROUGH EMBOSSING, NOT ONLY ON THE SERIAL #'S (O'S) BUT ALSO ON THE LETTERING, REFLECTING IT'S STRONG STRIKE AND CRISP PAPER! TO REPRESENT THIS PIECE AS A WORLD CLASS EXAMPLE IS AN UNDERSTATEMENT, BY FAR! COLLECTORS FROM AROUND THE WORLD HAVE SEARCHED FOR YEARS AND EVEN DECADES TO PROCURE SUCH A CENTERPIECE FOR THEIR COLLECTIONS! THIS PIECE BELONGS IN A MUSEUM, QUESTION IS... WILL YOU GET IT FIRST? 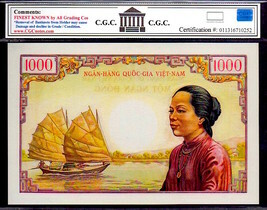 A VERY RARE OPPORTUNITY TO OWN SUCH A PIECE!